Roald Dahl gets another screen outing, this time from director Steven Spielberg, who adapts the story of a young girl caught up between the dream-dispensing Big Friendly Giant and the rougher, cannibalistic inhabitants of Giant Island. 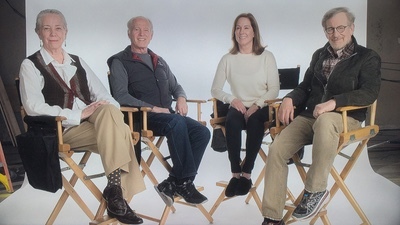 In recent times, Steven Spielberg has made something of a habit of bouncing back after a self-imposed hiatus with a double-whammy serving of new movies, one of which is intended to be an audience-pleasing blockbuster, and the other designed as something more personal, seriously minded and worthy of awards consideration. After a string of hitts in the 1980s, which saw his Steven Spielberg Presents banner mix broad commercial fare as Gremlins and Back To The Future with the films he directed (the more mature likes of The Color Purple and Empire Of The Sun), the director ploughed himself into perhaps the pinnacle year of his career: 1993, which saw him reach the zenith of the box-office heap with the first Jurassic Park and finally bring home Oscar gold with the extraordinary Schindler’s List. After another break, 1997 saw him repeat the trick with the Jurassic sequel The Lost World and the less Oscar-bothering but still critically acclaimed drama Amistad, after which Spielberg has recently alternated between films for himself (The Terminal, Munich, Lincoln) and his audience (Catch Me If You Can, Minority Report, War Of The Worlds, The Adventures Of Tintin). Even a personal Spielberg movie makes more money than some others’ intended blockbusters, which makes it all the more of a surprise when one of his films, especially a crowd-pleaser by design, outright bombs at the box-office, a fate that befell this live-action screen adaptation of Roald Dahl’s otherwise magical children’s book. Indeed, distributing studio Disney must have been as surprised as anyone when the director’s previous film, the Cold War thriller Bridge Of Spies, one of his “personal films” largely taken on as a favor to star Tom Hanks and expected to be a lower grosser, turned out to be quite the hit (and deservedly so), gaining an Oscar nod into the bargain for supporting actor Mark Rylance, who shocked by winning over favorite Sylvester Stallone for Creed and reteams with Spielberg here to portray the title character. That the likes of Lincoln and Bridge Of Spies would become the bigger grossers and more praised films than the intended blockbuster Spielberg directed for Disney under the deal with his Amblin Entertainment company perhaps says as much about where the director’s heart really lies these days as it does about the films he’s making, where the “personals” have begun to match or even surpass the blockbusters, much as has happened with Clint Eastwood. You don’t have to reach far to work out what went wrong with The BFG. Even as far back as when the project was announced, naysayers suggested that this was Spielberg’s attempt to capture the kind of magical British tale that he had missed out on when JK Rowling a young Brit be cast as her Harry Potter in the first film of that series, which Spielberg passed on when he couldn’t cast his choice of Hayley Joel Osment. Certainly the properties share a similar feel, but the eventual marketing of the film, from the gold lettering to the twinkly John Williams music, couldn’t really hide the fact that this seemed the latest in a line of Potter-light projects to come along after the huge success of that franchise. Coupled with this was that this new BFG was technically a remake, of the variously admired Cosgrove-Hall animated feature version, originally made for TV in the 1980s, to a larger than average budget and later given theatrical screenings. I was personally never much of a fan of the animated film, and even the original book has never been my favorite of Dahl’s work by a long shot, even though I’m otherwise a big fan, and of his more adult writings, especially Danny, The Champion Of The World – now there’s a story I wish Spielberg could get his movie mits on! With the combination of Disney’s lavish production and the director’s unmistakably assured touch, I was hoping this new film might have finally cracked the rather hard nut of a story in which two characters do an awfully lot of talking. Far off lands of giants, magical dreams and a little girl caught up in the whole adventure sounds right up Spielberg’s alley…so why does the resulting film feel so devoid of his usual magic? Set in a picturesque London once upon a time ago, when red buses and cars were mysteriously scarce on the streets of the capital and the pubs seem to have Irish jigs bursting out from them as if someone was playing a record of Williams’ Far And Away score (not actually so far off: it’s actually a track from Kubrick’s Barry Lyndon that we hear in the opening). The film retains the 1982 setting of Dahl’s book, but even back then the streets were never as strangely unpopulated as they appear here, making the stagey sets feel all the more less real. Here we come across an orphanage and meet young Sophie (Ruby Barnhill, slightly too old and not quite cute enough, though kudos that she’s not a usual Hollywood moppet), but the world isn’t really set up clearly enough and supposedly mysterious things are happening before we’ve really had a chance to get involved with Sophie and in her environment. Despite the Potter connotations, I was often most reminded of Spielberg’s Hook, also set in London and a film with many great elements that just didn’t always come together as a whole. There’s that same feeling here, albeit with a good deal less successful elements, with everything feeling as if Spielberg and his collaborators are just going through the motions, including composer Williams, who mixes his approaches to Home Alone, Potter and, surprisingly, AI Artificial Intelligence into a fairly gloomy score that doesn’t help this film feel any brighter. Another longtime associate, cinematographer Janusz Kamiński, shoots the film with that warm and stagelike War Horse glow, but ultimately there’s nothing that can really match the imagination of a child being told or reading the story for themselves, despite several beautifully realised visual moments. 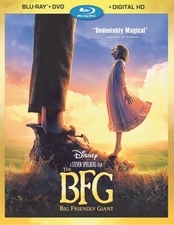 But the rest of the film simply lacks any real magic, with Spielberg’s usually sure-footed direction being an often uneasy mix of framing and cuts, as if he’s over shooting and editing to bring some interest, movement and momentum to the long stretches where it’s just Sophie and the BFG onscreen. Here, Rylance, through mo-cap, was on set to act alongside Barnhill, but maybe that disconnect in size had an effect on her less than fully involved performance, unusual for a child actor in a Spielberg film. There’s also a none-too successful decision to shoot most of the movie on a fixed camera alternating with the Giant in hand-held shots that are perhaps designed to show off the clever visual effects’ melding of animation, environments and live-action, but just come off as slightly disjointed, especially when the Giant picks Sophie up in his hands and the result just looks and feels wrong! 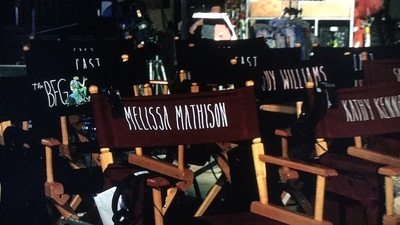 The best things about it remain in Dahl’s writing and his playing with language, carried over into Melissa Mathison’s script, her second and final collaboration with Spielberg before her untimely passing away. Fantastical words aside (something that I wonder if the author hadn’t picked up from the Sherman Brothers when penning the screenplay for their Chitty Chitty Bang Bang), I wonder if the source material just isn’t as inspired as Dahl’s other work, or that perhaps whimsical magic just isn’t the director’s thing? Most unusual for a Spielberg kid, Sophie isn’t at all relatable or even very likeable here, with an inconsistent accent that shifts between London and northern England, for those that might pick up on such things, while Rylance’s Giant himself seemingly comes from south of the country and the other Giants, although looking Celtic in design, from all over…a big mixup all around. That the film feels as slightly off as it does suggests a lack of the filmmakers being particularly invested in the project, with only Rick Carter and Robert Stromberg’s production design being a strong highlight. Apart from that there aren’t any memorable musical themes from the usually melodic Williams; no specific grandstanding setpieces from the director, and only one moment of real Spielbergian cinema when a young lad has a dream and we see it projected on the bedroom wall behind him, a nice touch. But there isn’t really any form of plot until way after the halfway mark, when a reason for all this to be happening finally seems to kind of fall into place, but by then things will have gotten tedious even for fans of the book or the animated version. We don’t even get an exciting climax, something we would expect – and at least hope for – from Spielberg, with a finale that’s over before it begins, is played for laughs and so loses any sense of tension, and comes at the end of a very long film devoid of any inherent charm. Even if the ending had worked better than it does, you still don’t watch a two-hour Spielberg movie just for the last five minutes and, though he attempts a clever one-take chase shot, the interaction winds up looking more fake than Peter Jackson’s King Kong dinos from over ten years ago. Despite a record breaking year, Disney has still weathered a couple of box-office duds, but while Pete’s Dragon, only a moderate earner, and especially Alice Through The Looking Glass were undeserving disappointments, The BFG in retrospect seems to have received a more appropriate collective audience shrug reaction. There’s just nothing to really engage the eyes, the ears or the heart, a strange off day for Spielberg in which the scenes just come and go along without ever making themselves felt. When asked how old he is, the BFG says giants are as old as time. “We just go on and on and on”, he says. So does this film. If you make it through the interminable main feature, you may find more interest in the several supplements that Disney has included here. 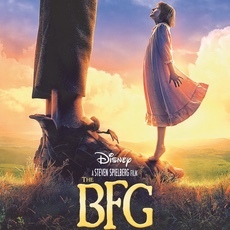 Spielberg isn’t one to record remarks on his films, so you’ll find no audio commentary here, but a near half-hour documentary, Bringing The BFG To Life, does a very fine job of providing an authoritative overview on the production and Dahl’s 1940’s Gremlins Disney connections. Told from Ruby Barnhill’s point of view, there’s plenty of on-set footage and peeks at what looks to be a very fun and enjoyable shoot, along with jovial talking heads from the director down through the main cast and crew, including writer Mathison and one of Dahl’s daughters, but oh…if only this infectious spirit had seeped into the final film itself! The Big Friendly Giant And Me is an “all-new short” promoted heavily on the box, which turns out to be something of a prequel scene, lasting under a couple of minutes and feeling like it could have made for an interesting “story sequence” in the actual movie, the best thing about it being the manipulation of drawings reminiscent of original book artist Quentin Blake, although he gets neither credit or a mention. Dahl’s tongue-twisting language is “translated” in Gobblefunk: The Wonderful Words Of The BFG, a three-minute compendium of meanings and explanations, and Giants 101 deconstructs the casting and motion-capturing of the inhabitants of Giant Island, where the really remarkable aspect is how much animation supervisor Jamie Beard resembles a younger BFG himself! Spielberg collaborated with the screen translator of The BFG twice (ironically on another movie titled with an acronym, E.T. ), who sadly passed away after production of this film but before it was completed. Fittingly, the disc closes with Melissa Mathison: A Tribute, celebrating the writer to whom The BFG is dedicated, in a deeply heartfelt six minutes that features moments from what must have been her last screen interview (tellingly, she remarks at how tough cracking the book into a screen format was) combined with comments from her friends and collaborators, in a lovely piece. 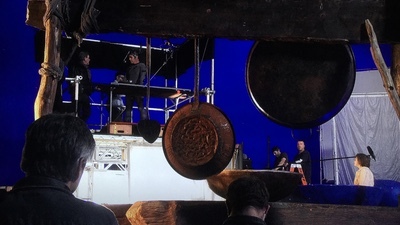 Disney’s usual practice of packing in a number of Sneak Peeks is remarkably restrained this time out: here we just get the teaser for next March’s live-action Beauty And The Beast re-do. A slipcover, at least in initial pressings, provides a nicer version of one of the theatrical posters on its front (which, if you squint at Sophie’s billowing dress, makes her silhouette look like a duck! ), while the back finds someone to proclaim The BFG as “an instant classic”, which is a now de rigueur quote for Disney releases but feels all the more empty here. The BFG‘s production design is perhaps its main strength, and Disney’s encode does a great job of showing it off, although some of the shortcomings in the digital effects not always being convincing are revealed too, but it’s a proficient transfer. John Williams delivers one of his most lackluster scores in many a year in The BFG, with only a hint of anything resembling a major theme used in the opening few minutes and then disappearing into the background, in a mix filled with so much whizz-popping that nothing really breaks through. But the intentionally muddled-up dialogue is never hard to understand, with French and Spanish dubs and subs also optional. The BFG strangely has the anti-Spielberg of Indiana Jones And The Kingdom Of The Crystal Skull at play. The story, director and producing studio should be a perfect fit but nothing quite gels together and the result is a remarkably gloomy movie, lacking cinematic magic, consistency, peril or triumph. After the director’s previous excursion into the digital animation realm with the excellent The Adventures Of Tintin, I was hoping that the same visual charm might bring Dahl’s tale to life, but the result is an often confused and tedious film that never finds its center from which it can ground the supposedly fantastical elements. Again, maybe Dahl’s original just isn’t the kind of story suited to a visual telling, with text and imagination a perfectly fine way to experience it instead. As a movie, it all falls oddly flat and lacking in so many ways. Disney’s disc package has a good documentary and is otherwise adequate, even if the movie simply doesn’t need more exploration and certainly isn’t a giant entry in Spielberg ‘s enormously prestigious list of wonderful movies. Let’s hope his next film for Disney, the fifth Indiana Jones, is better than both the archeologist’s last adventure and this outing. You’ll probably come up with your own meanings for the acronym, but for me this was unfortunately Bafflingly Flat Gibberish.